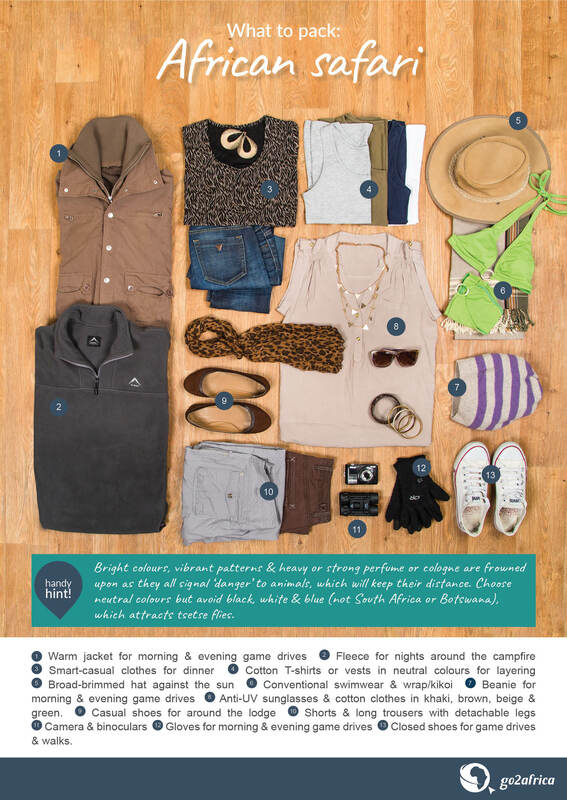 African safaris are jam-packed with outdoor adventure, so you’ll need to be dressed appropriately. As you experience the captivating sights and sounds of Africa, you won’t want to worry about being uncomfortable or picking out an outfit each morning. 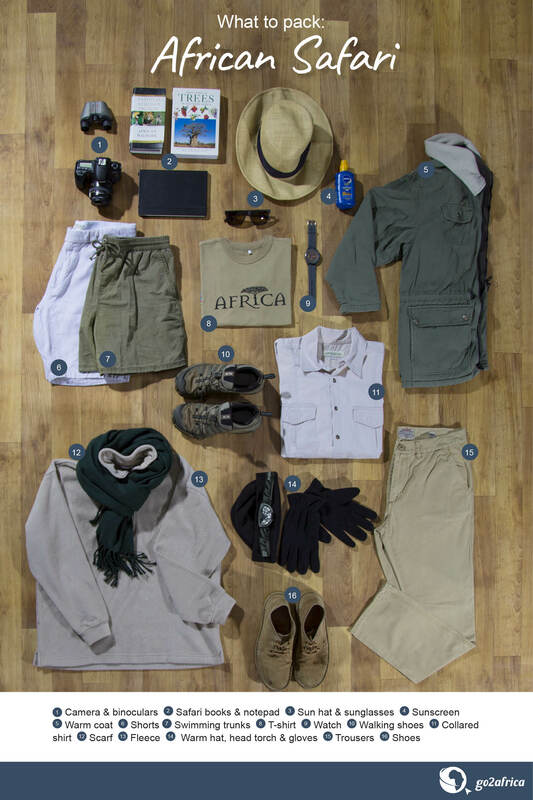 We’ve travelled extensively throughout Africa – in all kinds of weather, at all times of year – and have put together this handy infographic about the best type of clothing for a safari holiday. Africa has a reputation for endless sunshine but many first- timers are surprised by how cold it gets here. Peak safari season is at mid-year during the southern hemisphere winter and game drives leave before dawn and then go out again in the late afternoon, returning at dusk – both times of day when it can be cold, especially in the open vehicles that are more common in Southern Africa. Most vehicles come with blankets (and some even with very snuggly hot-water bottles!) but be prepared for cool temperatures during peak season, even in Kenya and Tanzania. If you are travelling in Green Season (the southern hemisphere summer from about November to March), then be prepared for the occasional afternoon thunder shower, some humidity and a bit of mud now and again. The best colours to wear are the dominant colours found in nature such as khaki, beige, light brown and olive green. When in doubt, go neutral, like shades of grey. Although animals are colour-blind, they’re very sensitive to high contrasts caused by bright colours, white and black, and loud patterns, and you will stand out to them as something unfamiliar, making them wary of approaching the vehicle. Avoid large amounts of white – it creates a very strong visual contrast for animals – especially in bright sunlight - and gets grubby very quickly (remember, you will often be on paved roads to dust is a given). Speaking of patterns, avoid large expanses of animal print on game drives. There have been instances of monkeys becoming agitated because they spotted leopard print and raised the alarm. No army camouflage. It’s illegal to wear in many countries because it is strictly reserved for the military. Avoid shades of blue (especially navy blue) and black as they attract tsetse flies. Very dark colours will make you much hotter if you are on an open vehicle. Sun protection is essential – make sure to have a wide-brimmed hat (that won’t blow off in the wind), high SPF sunblock and sunglasses. Try to use a sunscreen that doesn’t have a strong scent – animals are very sensitive to smell and once again will keep their distance if they detect anything unfamiliar. Light-coloured long-sleeved cotton shirts and trousers will keep you cool while also protecting you from the sun and from insects in Green Season. Shorts or trousers are more practical than dresses and skirts – you will be clambering on and off a 4x4 a few times a day! Mornings and evenings can be cold so pack both warm and cool clothing that you can layer, including a fleece or warm raincoat. A lightweight waterproof jacket is always a good idea. >A scarf or buff can be used as sun protection and will also help to fight a chill. You’ll need closed, comfortable walking shoes for guided nature walks that take place in the morning or afternoon, usually just around your lodge or camp; heavy-duty hiking boots are only necessary for multi-day walking safaris. Generally, trainers are perfect for peak-season safaris. Bring an outfit or two of smart-casual attire for dinner, and any overnight stops in the city. Remember that many lodges have complimentary laundry services so you can easily get items washed. Binoculars come in handy, especially if you are visiting national parks where you are not permitted to go off-road to get closer to the animals. In private concessions and conservancies this is not usually an issue as vehicles are permitted to go off-road but they are still useful for watching birds, smaller animals or seeing details like a lion’s teeth or ostrich’s eyelashes. Don’t forget your camera, charger and spare memory cards. If you are travelling in summer or have a heated pool at your lodge, pack conventional swimwear and a wrap or cover-up. Flip-flops or sandals are handy for walking around camp. Check the local regulations before you pack your drone. Drones must be licensed and you must have a permit to fly them. In many areas, they are not permitted as they hamper anti-poaching measures. Rangers may be empowered to confiscate ‘illegal’ drones. For ladies, sports bras are very useful for bumpy 4x4 game drives and road transfers! Personal head lamps are helpful in more remote or eco-friendly camps, especially if you want to read at night. Solar-powered bedside lamps may not be bright enough, and at some lodges the electricity is turned off at a certain time. If you really suffer from the cold, consider packing lightweight gloves and a beanie or woollen hat. Think twice about items like electric toothbrushes and razors, hairdryers, flat irons, perfumes and colognes, and expensive jewellery. If you are taking transfers on a light aircraft, the space available for your luggage is very limited. There will be a strict weight restriction and all baggage must be soft-sided to fit in the hold. The interiors of these aircraft are very small so there is extremely limited space for hand luggage. 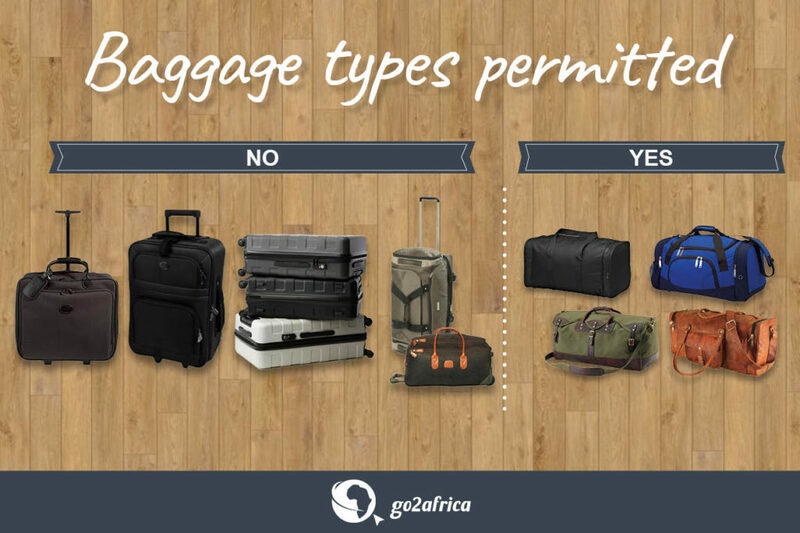 If you are unsure of whether to pack something, check with your Africa Safari Expert. And don’t forget that many lodges have small safari shops where you can pick up another peak cap, scarf or sunscreen if you forget yours! Want to know more about Africa’s secret places and incredible wildlife? Sign up to our newsletter for insider info on African travel. If you’re ready to start planning your dream adventure, get in touch with a friendly African Safari Expert today.